Inspired by youth culture and paranormal worlds. Rick Owens steps away from avant-garde silhouettes and applies the abnormal to his latest Spring/Summer 2019 offering, an alien-patch canvas belt bag. Releasing under the DRKSHDW diffusion line, the belt bag nods to youth culture and paranormal activity by blending gritty graphics with the pop culture staple accessory of the season. Constructed from cream canvas the bag has a raw look to it, featuring tattered drawstrings (similar to the designer’s trouser drawstrings) and a burnt laminated window holding a photo print of a child. 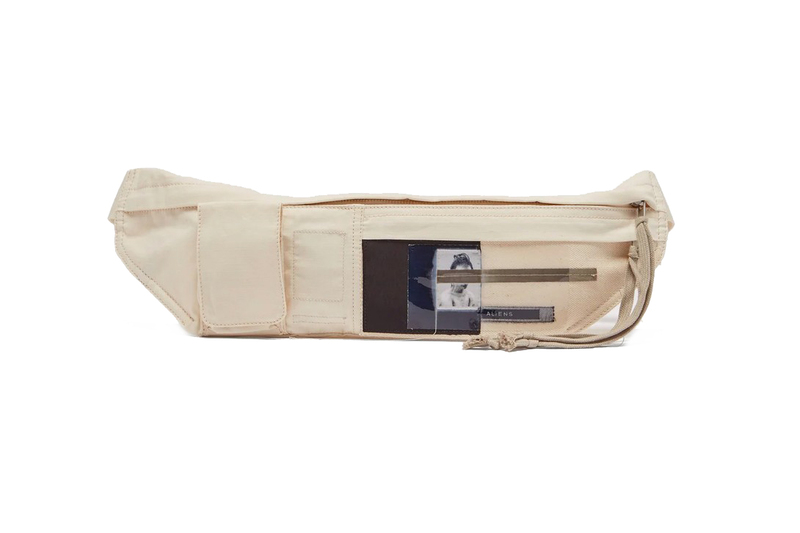 The belt bag is finished with a large internal zip-pouch, a velcro external pocket and a plastic clip to secure the bag around your body. Priced at £330 GBP, head to Matchesfashion.com to pick up this one-of-a-kind luxury staple. In other Rick Owens news, check out these complementing DRKSHDW duck taped Ramones that just dropped. Inspired by John Cardiel, Chris Pfanner, Jeff Grosso & Tony Trujillo. Shot on the streets of Milan. Silver surfer in the flesh. Wrapped in a “White/Black/Burnt Orange” colorway. The botanical looks are selling out fast. Riccardo Tisci joins the chunky sneaker brigade.